Micro Systems Technologies (MST) offers highly reliable substrates utilizing LTCC (Low Temperature Co-fired Ceramic) technology. The LTCC technology provides excellent RF and microwave performance characteristics, and allows co-firing with highly conductive metals such as gold and silver. The superior mechanical and electrical properties, and the ability to embed passive components make MST's LTCC substrates ideal for high frequency applications. LTCC substrates are housed in high-frequency low loss sensor packages with multi-chip modules. Features include multilayer technology (up to 20 layers), gold and silver based metallization systems, fine line patterning, and embedded resistors, capacitators, inductors, and strip lines. 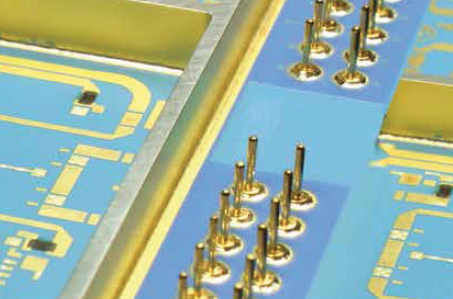 These substrates have a high frequency performance capabilities up to 90 GHz through the use of low loss ceramics. For more characteristics, specifications, and package features, download the brochure.